Chris left Drama School in 1969 with "The Spotlight" Award for Best Actor of his year and went immediately into repertory at the Octagon Theatre, Bolton, followed by long seasons at Leatherhead, Hornchurch, Leeds and Colchester playing such parts as Sloane in Entertaining Mr. Sloane, Sir Mordred in King Arthur & The Round Table, Brian in A Day in the Death of Joe Egg, Mr. Worthy in The Recruiting Officer, Emory in Boys in the Band, William Featherstone in How The Other Half Loves, Leonard in Time & Time Again, Dogberry in Much Ado About Nothing, Fancourt Babberley in Charley?s Aunt and Henry in My Fat Friend. He made his West End debut at the Savoy Theatre in 1989 playing Second Comic to Mickey Rooney in Sugar Babies, and, from 1991 onwards, played dame in pantomime for Roy Hudd every Christmas for ten years at the Watford Palace Theatre where he also directed the last three pantos before the building closed for refurbishment in July 2002. Throughout this period he also appeared in many television series over the years with such stars as Ken Dodd, Barry Took, Tom O'Connor, Frankie Howerd, Jimmy Edwards, Eric Sykes, Hale & Pace, Bruce Forsyth, Phil Cool and Hinge & Bracket - not forgetting over eight years as writer and performer with Ted Rogers on Yorkshire Television?s hit quiz show, "3-2-1". BBC Radio Two?s hugely popular show, The News Huddlines, which he did with Roy Hudd and June Whitfield, broadcast two series a year continuously over 26 years and during that time received just about every radio award possible before ending in 2001. Extensive writing for radio, stage and television includes the BBC's 3CD set celebrating the works of Douglas Adams, creator of Hitchhiker's Guide to the Galaxy. After Watford he donned skirts once again to play dame for both the Qdos Company, in Jack & The Beanstalk at the Arena Theatre in St. Albans, and the Hiss & Boo Company, in Aladdin at the Millfield Theatre, Edmonton. After taking a break for two complete seasons of legitimate theatre at Shakespeare's Globe (Angelo in "Comedy of Errors" & Aemilius in "Titus Andronicus" and the Regent's Park Open Air Theatre (Quince in "A Midsummer Night's Dream" & the Porter in "Macbeth"), he returned to the role of dame in panto for the next six years at Brick Lane Music Hall, where he also wrote and directed the shows. He was elected to membership of the Order in 1999, proposed by PKR Roy Hudd and seconded by PKR Gorden Kaye, and rose through the ranks of officers to reach Prince Rat in 2006. Since then he has been the proud recipient of three honours; Rat of the Year, the King Rat Award, and Badge of Merit. 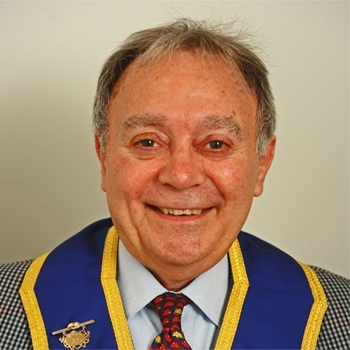 He is also a member of the Grand Council and a Trustee of the Charities Fund.